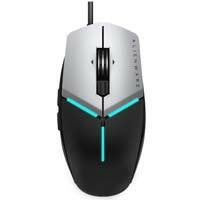 Alienware's Elite gaming mouse leverages advanced comfort engineering to offer an uncompromised gaming experience. This generation introduces a slimmer design for improved comfort and ergonomics. With four variable levels of weight adjustment, five configurable levels for DPI switching, AlienFX, and 11 programmable buttons, gamers can masterfully control their in-game experience.